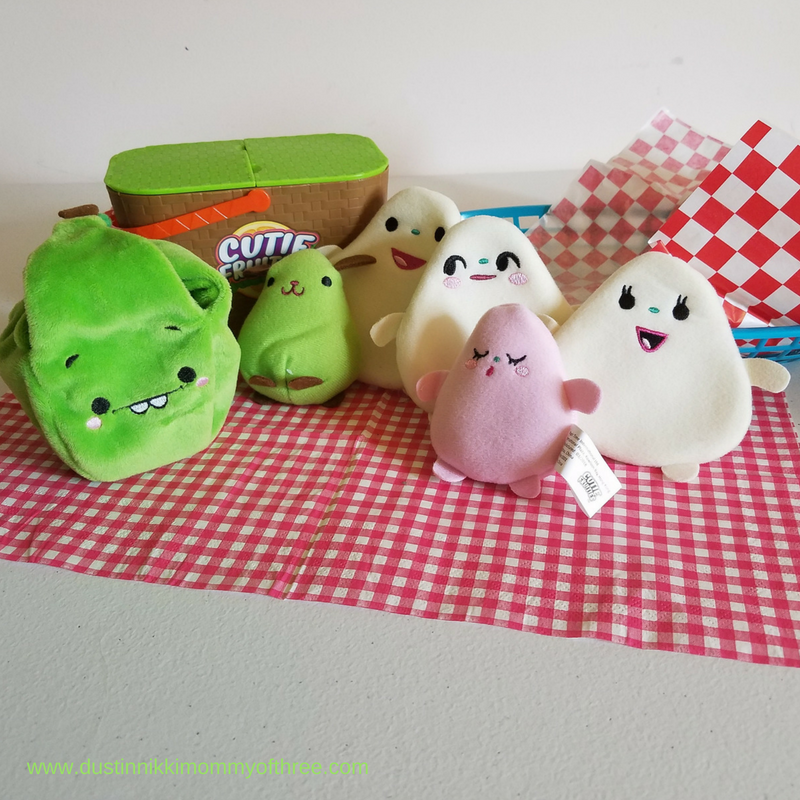 Cutie Fruities Plush Fruit Toys are adorable! A couple weeks ago I was contacted by a marketing representative for Cutie Fruities and was asked if DustinNikki Mommy of Three would like to collaborate with a review. 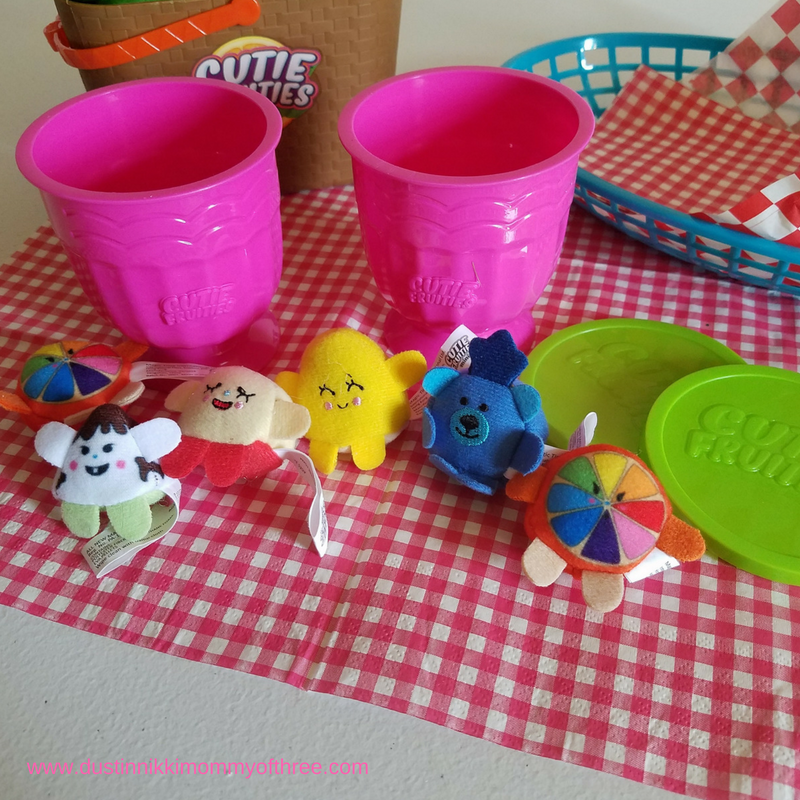 I was sent a few Cutie Fruities products – two of the Cutie Fruities Minis Cups and one Cutie Fruities Basket for our use and review. So what are Cutie Fruities you ask? Well, they are little plush fruits that even smell a little sweet. 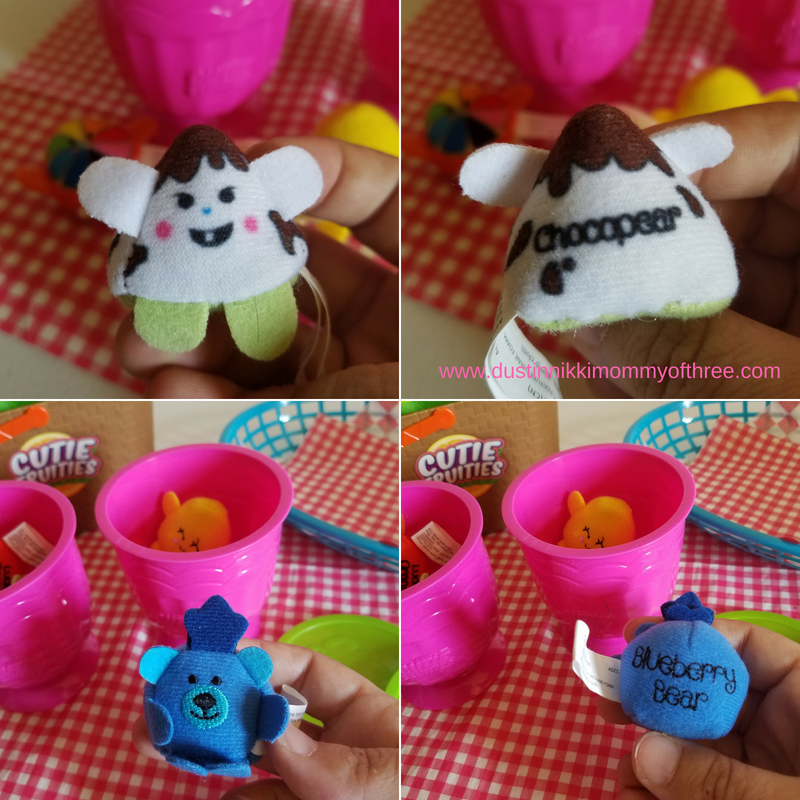 There are minis that are really fun to collect and there are also fruit families that come inside the basket. These toys will be available in Walmart stores on June 1st! The Cutie Fruities Minis Cup is perfect for collectors. 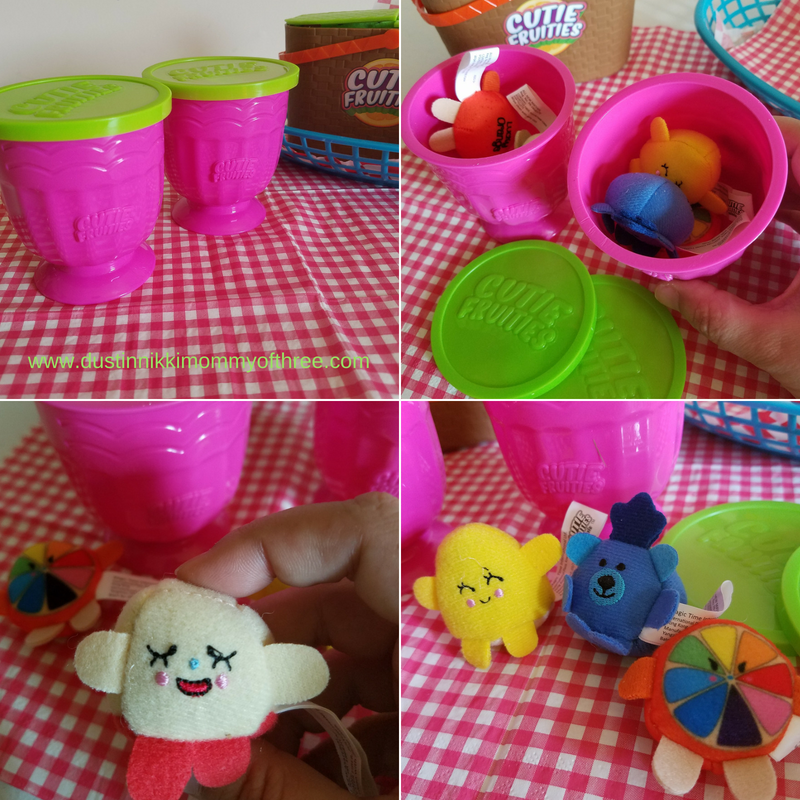 Filled with three mystery plush and over 40 to collect – common, rare and limited edition – these cups are the must-have travel sized snack for all collectors! I am going to start with the Minis Cups. These cups are super cute and inside each cup, there are three surprise minis along with a collector’s guide/checklist. Inside both our cups, there was one Fruitie that was in a little bag that you had to open. The other two weren’t in a little bag. My kids like to call little toys in bags “blind bags” so I guess that is what I will call it. I’m not sure why only one was in a bag but I have an idea that it’s because they are either scented or could possibly be a rare or limited edition one. Not that it will be guaranteed that you will get one of those ones though. One of the ones we got in a bag was a common one while in the other cup, we actually got one of the limited edition chocolate covered ones! These little guys are so cute. One of my favorites was Blueberry Bear. Some of them are only fruits while some others are a fruit/animal mix. They each have a name and their names are embroidered on the back of each one. This little blueberry looks like a blueberry and a little bear in one! How adorable is that?! The limited edition chocolate covered Fruitie we found is super adorable too. It’s name is Chocopear. It’s a little pear piece that looks like it has some chocoloate covering the top. This one smells really sweet too. I love their little faces. Each one has their own face making them all look like they have their own personality. Some of their faces are embroidered while others are not. Out of both cups the six total that we got were two Lucky Orange, Blueberry Bear, Chocopear, Baby Banana, and Mama Apple. They all smell really sweet too. I can’t pick anything out in particular though and I think that’s because they are all inside a cup together and the scents mixed together. But it’s a light and pleasant fruity scent. 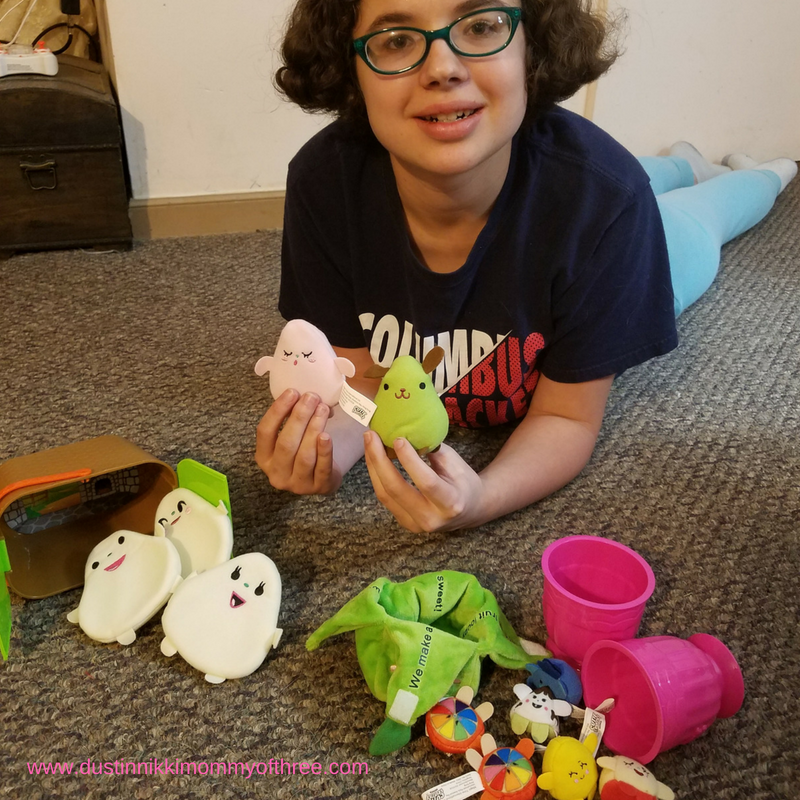 My daughter loves these little guys so I am going to have to make sure to buy some more when they become available at the store! I think the company does a decent job at trying to keep you from getting a bunch of the same ones and mixing them up pretty well. We only had two cups to begin with though but we still only ended up with doubles once – and they were not in the same cup. Open the Cutie Fruities Basket for an entire fruit family – Mommy, Daddy, Baby and More! The Fruit Basket comes with four scented plush fruit slices wrapped in a fruit peel, a fruit fortune and sticker sheet. Turn your basket into a fruit themed play set for hours of fruit fun! Next up is the Cutie Fruities Basket. 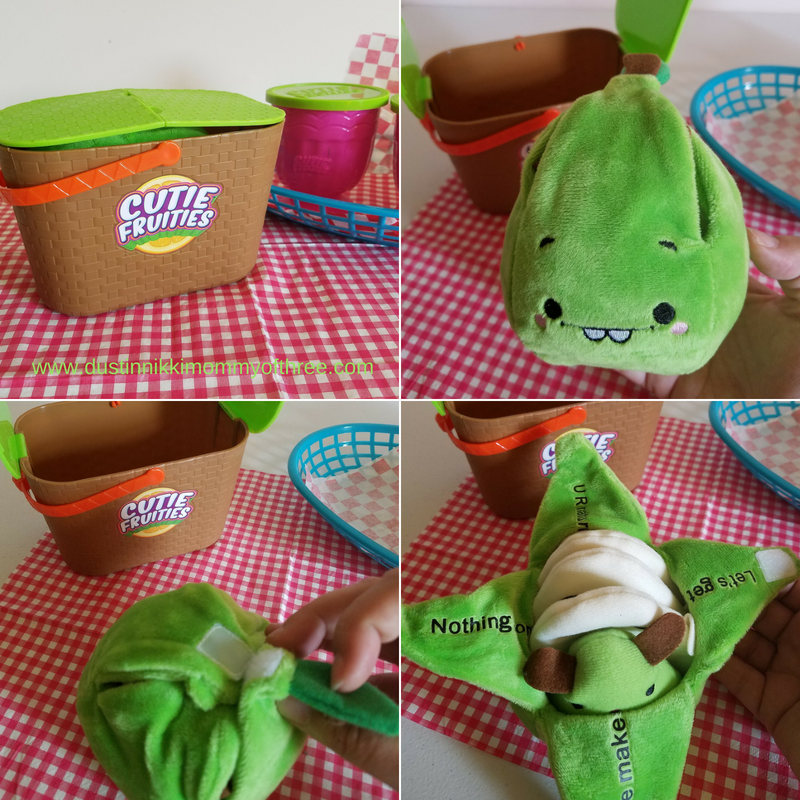 Inside the basket is a larger plush fruit that can actually be peeled! The parts that can be peeled and opened are closed with velcro. As many times as our Pear that we got in our basket has been peeled, the velcro hasn’t lost any “stickiness”. The part that can be peeled is super soft and the face on this big piece of fruit is super adorable. I know, I say the word adorable a lot when it comes to these toys but I can’t help it. The fun of this one is that once the fruit is peeled, inside is a whole fruit family consisting of fruit pieces and slices! The each fruit family piece has their names on the back of each one. Our pear fruit family included, Pear Pup which happens to be a little green pear. There are three pear slices and one is Papa Pear, another is Mama Pear and the other is Big Sis Pear. The last but not least is a smaller little pear that is pink and that one is Baby Pear. There faces are super adorable! There’s that word again. I love Pear Pup. His little puppy ears are cute. All the pieces have a really sweet pear scent to them and I love the scent! My daughter loves the basket just as much as the minis. The fruit family is pretty easy to put back into the big fruit and close it again too. I can see younger kids may needing a little help with it though maybe because the pieces do fit pretty snug. The basket can also be used as a play set. There is an image on the bottom of the basket and if the basket is on it’s side, you can use it like a little house with the scenery on the bottom of the basket. We love them! They are fun for the collector for sure. The minis are super fun to collect and can be checked off with the checklist. There’s something really fun about surprise toys. At least my kids think so. My daughter is hoping to find some rare glitter ones when we buy some more. The fruit family basket is super cute. My daughter loves it too. She thinks it’s a coolest thing ever. But I think the minis are more appealing to her since she’s older. She’s more of a collector. Of course her fruit family is also part of her collection as a whole. I think the fruit family basket is great for imaginative play. 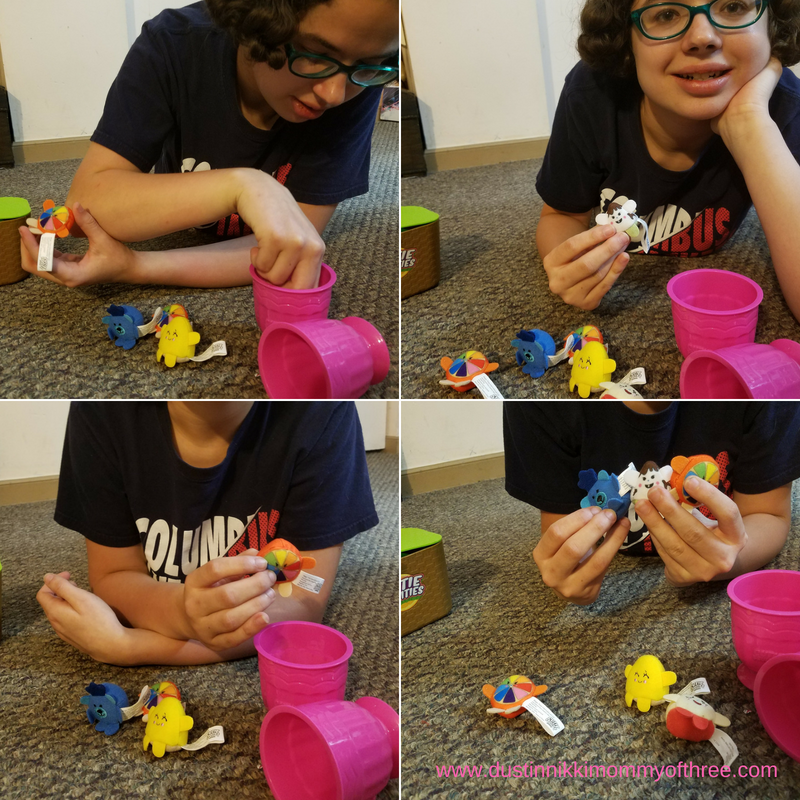 Of course even the minis can be great for imaginative play too. The age recommendations are for ages 3 years and older. I think it’s a good recommendation since the minis are pretty small. Again, we love them. They are cute, fun to collect, fun to play with, fun to be surprised, and they smell pretty sweet! 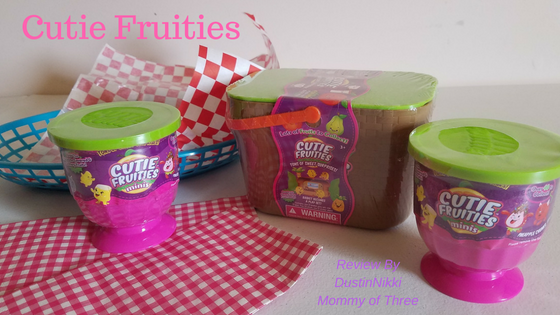 Buy It: Cutie Fruities will be available at Walmart stores June 1st! I will update with average sale prices once I have an idea of what those are. Make sure to check out CutieFruites on Twitter, CutieFruities on Instagram and CutieFruities on Facebook! 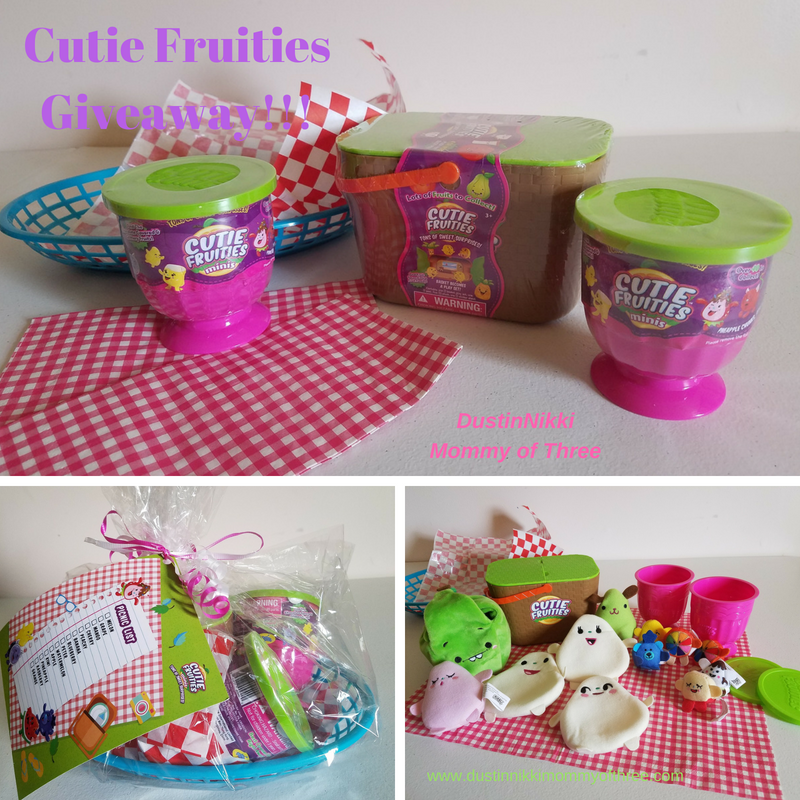 One of my lucky DustinNikki Mommy of Three readers will win Two Cutie Fruitie Minis Cups and a Cutie Fruities Basket! Giveaway is open to the Continental USA. See complete terms and conditions below. Terms and Conditions: Giveaway is open to the Continental USA and D.C. Must be 18 to enter. Giveaway will end June 13, 2018 @11:59pm EST. Winner will be chosen using Rafflecopter powered by random.org. Winner will have 48 hours to respond after I, Nicole from DustinNikki Mommy of Three contact via email. If winner does not respond, a new winner will be chosen. No purchase necessary. Void where prohibited by law. A representative of Cutie Fruities Toys will be responsible for product shipment to the winner(s) of this giveaway. DustinNikki Mommy of Three is not responsible for lost or stolen mail. This event is in no way administered, sponsored, or endorsed by, or associated with, Facebook and/or Twitter, Google, Pinterest. Good Luck! Disclaimer: I was not compensated for this post. However, I received free product mentioned in this post from a representative of CutieFruites in exchange for my honest review. Brand is also sponsoring this giveaway. All opinions expressed in my review are 100% my own. I think they are adorable and I was pleasantly surprised to learn from your review that they are scented. They look so much fun and I love that they are scented, my niece would love these. My 7 year old step daughter would absolutely love these! They are similar to shopkins and her entire world is shopkins. I like these better though because they seem more appealing in size and they are plushies! So adorable to open them up and reveal the family inside! Plus, the scents. Seriously. What kid wouldn’t love these! I love that they’re scented and that they are collectibles. I like the fact that they pack inside each other for easy storage. These are so cute and love that they have a smell. Thank you! I love that these are scented! Every bedroom needs something smell good! Love the faces and they are scented! I never heard of this before but I like that they are scented. Cutie Fruities Plush Fruit Collectible Toys are great imagination inspirations! I like the self storage and the healthy eating tie-ins. I love how theyhave a scent how awesome. My kids would love those. I like the Cutie Fruities Plush Fruit Collectible Toys,because they looks so soft and cuddly with an added bonus of a sweet smell. My granddaughters would like that it’s a surprise what you get. They would like that they’re scented too. Our Samantha just thinks they are so cute! My daughter would love the little basket that it comes in! I think her favorite would be the Pear Pup! I’m betting my kiddos would be obsessed with these! They are so cute! My babes especially loves being able to put things in and out of containers, what a cute way to learn a little! Never heard of these, like how they are scented. My Granddaughter loves surprises and these would be perfect for her. These are so cute. My little girl would love them. Cheery and Charlie Cherry are so adorable. Haven’t heard of them, I know my daughter would love it! 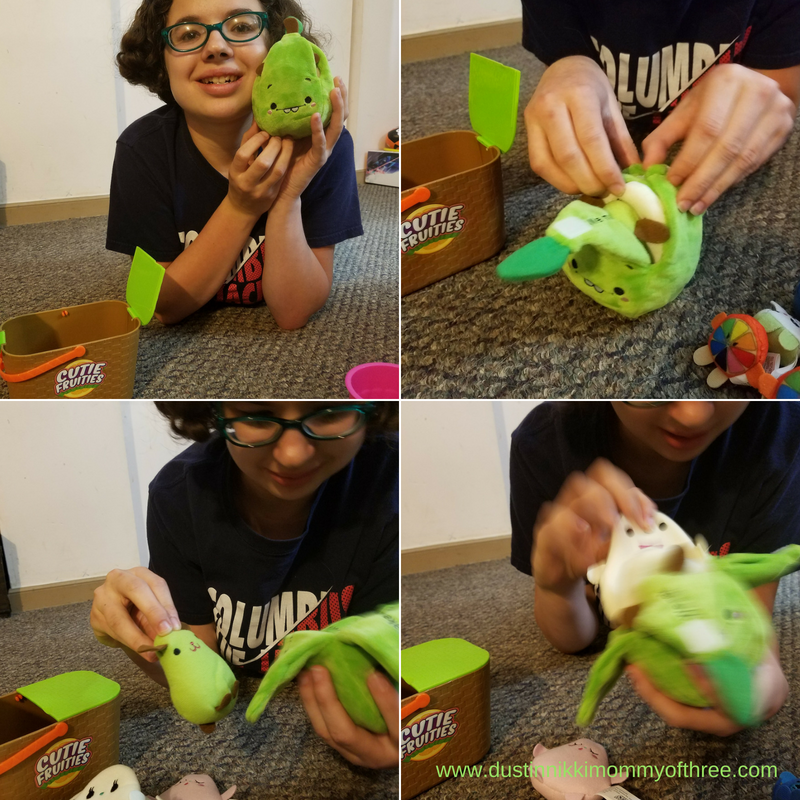 My kids love surprise boxes and bags, this is something I know they would love as well. My daughter loves to collect little things like this- she has a lot of Shopkins, and I think this would be right up her alley. I love that they smell as well. Will bring me back to my days of Strawberry Shortcake dolls. These are so cute , love that they are scented and how cute their faces are . My kids would love the surprise of what they would get to open. I love the uniqueness of this product. I will definitely check out the website. I learned they’re scented, I love that! And that you can peel some of them like real fruit! I think the kids will love the surprise aspect to them. I like that they are scented. They are so cute too. my son is finally in love with eating fruits! he would love that these smell! These are super adorable! I love that they are collectibles, with rare and limited edition ones. I also like the family basket! I like that the larger plush fruit can actually be peeled! How fun is that!